The earliest reports on Ascot pipes point to the French company La Bruyère in Saint-Claude. La Bruyére was a joint venture founded in 1932 by Chacom and another, yet unknown firm. Disbanded in 1957. Chacom continued Ascot as a sub-brand. Elder pieces don't bear any signature of the manufacturer. 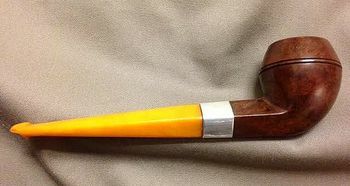 Recently seen Ascot pipes have Chacom's logo "CC" on the stem. These pipes, described "Army push-bit system, acrylic application in horn optics, 9 mm filter", are marketed in Germany. Not to be confused with another France made brand named Royal Ascot suffixed "Algerian Briar"! H. Perkins & Sons (Henry P. and sons Arthur and Henry Charles) - so since 1901 - were long-established silversmiths in London. The firm was converted into a limited liability company in 1922 as Henry Perkins & Sons Ltd. Later Perkins got famous for exquisite silver lighters - supplying among others Dunhill. Vice versa H. Perkins & Sons, later a branch of Beney Ltd., had made Ascot pipes as private label by Dunhill. With a little bit of good luck one might found very attractive pieces.¹ Ca 1960's to 1980's. Finally, Ascot pipes of Italian descent are offered in the USA. Budget pipes advertised "These rusticated Italian pipes come in a variety of unique shapes and are a perfect addition to any smoker's collection. I challenge you to find a better pipe for the money." Some bear the residual name "Barracini" - others not. Barracini itself is obviously an inferior outlet of ?. 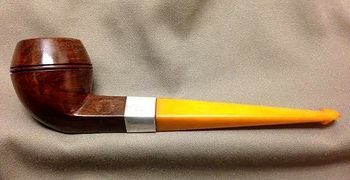 ¹ The author bought an Ascot "S" 07 - a Bent Billiard - back in 1976. Price was 33.00 German Marks. Terrific sand blasting and finished in oxblood red ... just like the nearby Dunhill Redbarks. These showing boring blasts but asking 335.00 German Marks. This page was last edited on 10 July 2015, at 09:55.